One of the big annoyances of an art critic is that you are constantly missing exhibitions, or seeing them only at the very last moment. This is nearly the case with Akim Monet’s exhibition "The Aggressive Line" at his Side by Side Gallery – but fortunately, not quite. Anyone who is in Berlin this Saturday should take the opportunity to see the show on Potsdamer Straße on its last day. In this exhibition, small works of art have a big effect. With just six drawings by Ernst Ludwig Kirchner and four drawings by Willem de Kooning, an arc of almost 50 years is spanned from 1915 to 1964. The omnipresent theme of portraying women is merely a pretext for both artists to work with variations of form. 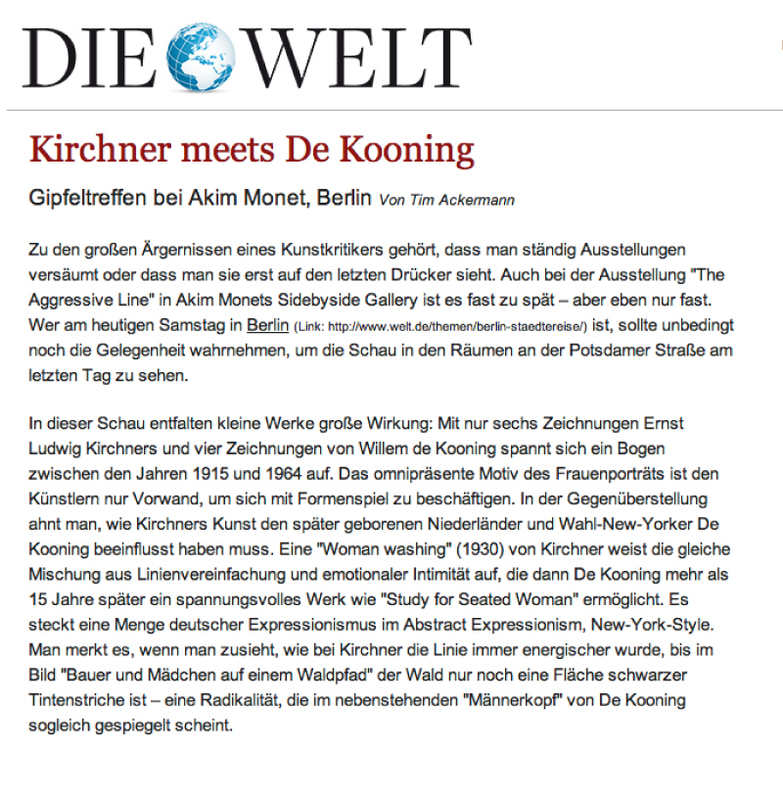 Through this juxtaposition, one might sense how Kirchner's art could have influenced that of the younger de Kooning, the Dutch-born New Yorker. A “Woman washing” (1930) by Kirchner displays the same mix of lines to delineate emotional intimacy than those used by de Kooning 15 years later in his arresting “Study for Seated Woman.” There is a lot of German Expressionism in Abstract Expressionism, New York style. You realize this watching Kirchner's line become more and more aggressive until, in “Bauer und Mädchen auf einem Waldpfad,” the forest is nothing more than a plane of black ink strokes – something radical that instantly seems to be mirrored in De Kooning's “Man's head” hanging beside it.